I often appreciate reading a whole book, like Laura Hillenbrand’s Unbroken, and just being blown away by the story in its entirety. Unbroken remains for me one of the top 10 books I’ve ever read. The fact that not only was it a true story but one ultimately ending in redemption and forgiveness, well, I just can’t recommend it enough. Sometimes though in other books, I might only take away one thought, one idea or one quote. That one thing sticks with me more so than any other part of the book. I might enjoy the whole book, as was the case of Heart in the Right Place by Carolyn Jourdan, but there was one passage that as I read it, I just knew that it was meant for me. Has that ever happened to you? Heart in the Right Place is kind of a “local” story for me, because it was written in and about a place that’s close to an hour away from where I live. The author was a senator’s aide in Washington, DC when circumstances dictated that she move back home to East TN to care for her aging parents. The book is an amusing and touching memoir about her adjustment to a new life in a completely familiar, yet somehow foreign place. During her period of readjusting to life into rural Appalachia, she comes to appreciate the simple truth and beauty of a life less complicated. A life where people without much exposure to things beyond the foothills of the Great Smoky Mountains possess a plain and quiet wisdom. I was stunned. Such an interpretation had never occurred to me and it sure wasn’t what they taught in church. Fearlessness didn’t come from being comforted, being patted on the back by God, and having our fear reduced. It meant making a conscious decision not to indulge ourselves. We had to intentionally turn things around, like when Virgil convinced Dante that the best way out of hell was to climb up the hairy-legged devil himself. “But that’s just it,” Fletcher said. “Everybody gets scared. It’s okay to feel scared. But you can’t let it run your life. If you’ll just mind the Lord on this one thing, you don’t hardly need any courage – or even faith. “Just mind Him in the one thing, ” Fletcher said. Like the author, it was a revelation to me. A few years ago, this book was one I chose to read to my kids as our daily read-aloud in our homeschool. I chose it for no other reason than that it was a local book. I thought they’d appreciate hearing about where they grew up from a different perspective. I pretty much try to maintain a 50/50 balance of reading fiction to non-fiction, whether it’s for myself, or for when we still homeschooled. Sometimes real life is more interesting than the imagination! Little did I know that the book I chose to read for them, really was meant for me! That one passage… meant to calm and reassure me. Meant to instruct me to “fear not.” Meant for me because at that time in my life, I had a lot of fear about the path my prodigal was on. Like the author, it hadn’t occurred to me either that not fearing was a decision we have to intentionally make for ourselves. I always assumed it meant that God himself would give me the faith to overcome the fear, not that I needed to determine whether I would give in to the fear or not. But the more I pondered this, the more I came to see that it was something I did on an almost daily basis anyway. And if you think about it, you probably make small choices each day to not give in to fear as well…. For instance, I always have a moment of fear when I’m driving on a rainy day and I approach a curve, because a couple years ago, on a rainy day, a driver coming the opposite direction lost control of his car on a curve and hit me head on. Fortunately, we were both going slowly so no one was really hurt, but my car was totaled and I remember the feeling of utter helplessness as I watched his car careen into mine, knowing there was nothing I could do to prevent it. Yet, I still drive and make the choice to overcome that fear as I enter a curve on rainy days. Or the few times I’ve had some kind of medical procedure where anesthesia is involved, I have a twinge of fright that I might not wake up, because that happened to a neighbor of mine when I was growing up. Still, I know that the chances of that are very very slim, so I face the fear and get on with it. Knowing that I have “small” fears each and every day, but already make a conscious decision every time to face them, somehow makes it easier to know that I can choose to surmount the larger fears and doubts as well. I had doubts. misgivings, anxiety and often moments of panic that I “could never” homeschool or run those marathons. I didn’t go into them thinking they would each be a piece of cake. Instead, I chose to approach homeschooling one day at a time, and training for the marathon one step at a time, one run at a time. I faced my fear on a small scale, which allowed me to overcome the thing as a whole. God is so merciful to allow us the small victories. In them, we’re encouraged to know the larger ones are already won. 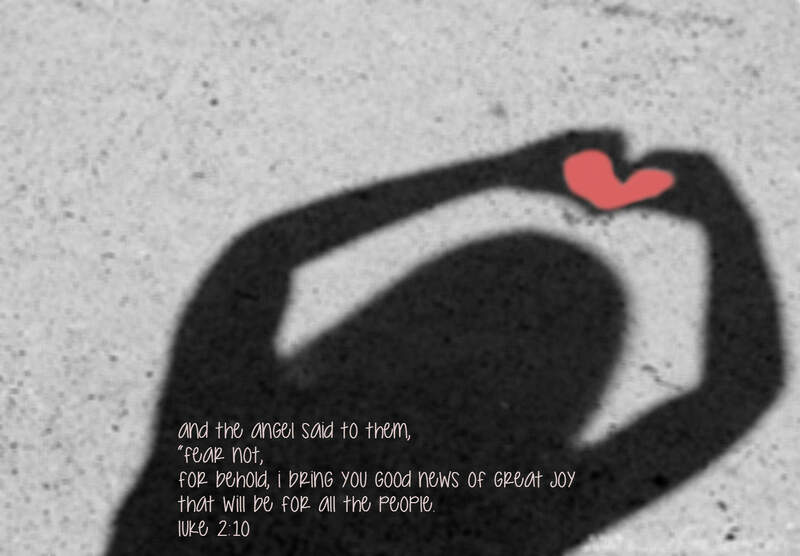 Really, on the other side of fear is everything we ever wanted – good news of great joy! Surely we can obey Him and choose to fear not? You’ll love Unbroken. I don’t think I’ve ever read a non-fiction book that made me turn the pages like it was a thriller. Parts of it were hard to get through, but oh, so worth it! You’ll have to let me know when you’ve read it. In some places it’s very hard to get through, but it’s an incredible story.